CPAP Supplies / Cleaning / Citrus II CPAP Wipes Singles - 12pk. Review: Citrus II CPAP Wipes Singles - 12pk. 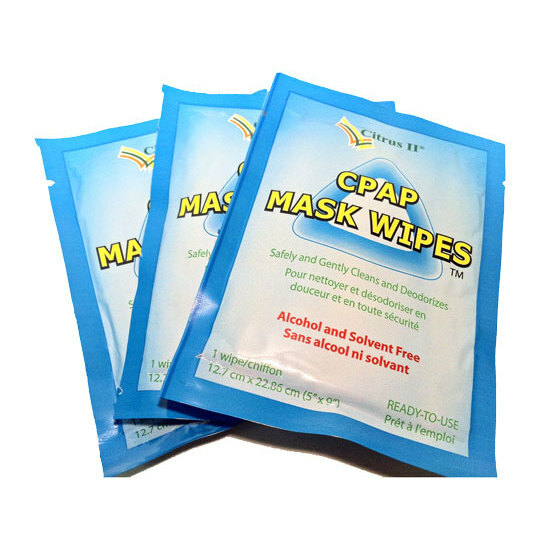 Citrus II CPAP mask wipes are perfect for daily cleaning and deodorizing of your CPAP mask. The fresh 100% alcohol free citrus scent is just enough to provide a clean feeling while not being too overpowering to be close to the face. This product contains 12 individually wrapped wipes for travel and convenience. The wipes are also available in a 62ct dispenser. Cleaning liquids from Citrus II are also available. To use: Wipe surface of CPAP mask with wipe. Let air dry before use. Individually wrapped 12 pack of CPAP wipes. For daily use to clean and deodorize your CPAP equipment. Customer Reviews of the Citrus II CPAP Wipes Singles - 12pk. These little wipes are great! I pack a few in my purse and use them wherever I need them. Of course, I use them on my mask too. Great For travel. In the past I have put up to 10 regular ones in a plastic bag before I found these. The regular ones in a handy-bag don't work well. These travel wipes work much better. Worth the cost if you travel a lot. It's a real good product I use it a couple times but I'm going to use the most on my vacation some places don't have good soap and water. This would be the perfect for on-the-go. I highly recommend this product for other people. These CPAP wipes singles are perfect for when we travel. I don't know how we got along without them. We plan to always have them available on future trips. Thank you!